(CNS): Organisers are encouraging runners to register as soon as possible for the fifth annual Off the Beaten Trac, a 50k ultra-marathon and relay race set for Sunday 23 February. Competitors can participate in Cayman’s toughest race either individually, or in a team of six. 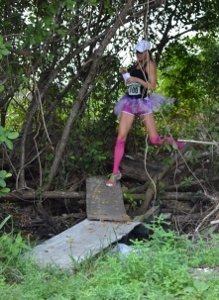 Originally devised by race founder and KRyS Global’s Executive Chairman Kenneth Krys, Off the Beaten Track is a unique test of endurance, that will see contestants run through some of Cayman’s toughest terrain, including bush trails, dyke roads and on the beach. In a bid to ensure that this year’s course will continue challenge seasoned participants, Derek Larner from Race Caribbean is designing the course. The idea came about after Krys had participated in the famous Marathon des Sables in Africa’s Sahara desert, the toughest race known to man that takes participants through some of the most inhospitable terrain of the world. With the running scene so popular and competitive in Cayman, Krys wanted to offer this unique and challenging experience to the local running community. Krys is hoping to beat last year’s record turnout on this fifth anniversary of the event. KRyS Global, has been the main organiser of Off the Beaten Track since its inception with support from, Tower and sponsors Brown Rudnick, Ritch & Conolly and CaymanActive.com. Entry to the race costs $300 for a team of six people and $100 for individuals and all proceeds will go towards helping the needy both in Africa and in Cayman as well. Online registration is now open at www.offthebeatentrack.ky. Corporate sponsorship is still available and volunteers are welcome. Interested parties should contact Catherine Healy at 947 4700 or OTBT@KRyS-Global.com.